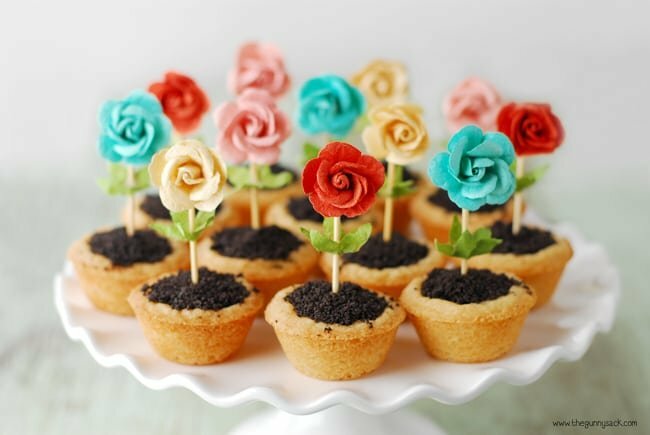 These Flower Pot Cookies are perfect for spring! 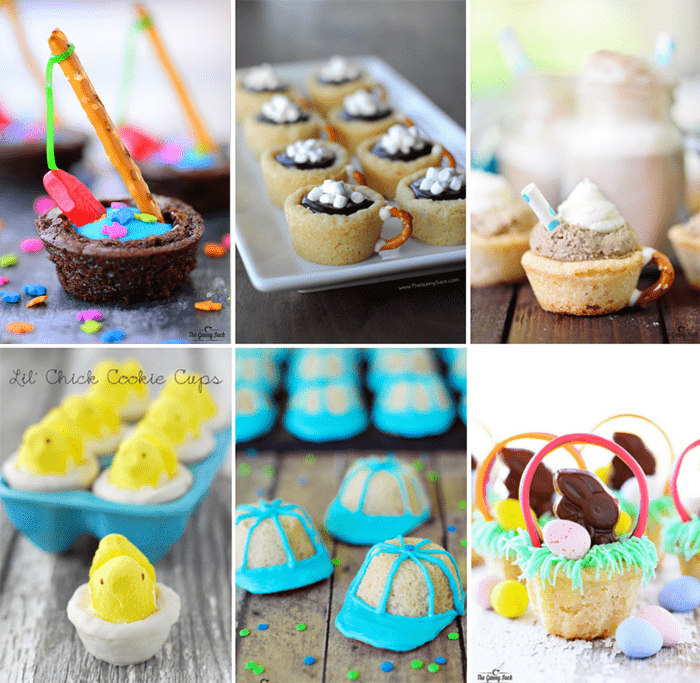 The bright colors pop and the easy recipe makes them a fun party idea. 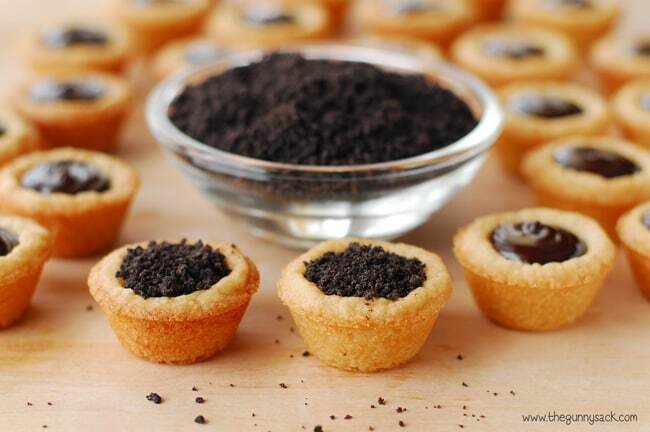 With sugar cookie cups, chocolate ganache, and Oreo dirt, they are as good to eat as they cute to look at. Anyone else excited about spring? The snow is gone, the tulips are coming up and we can finally be outside without a coat. 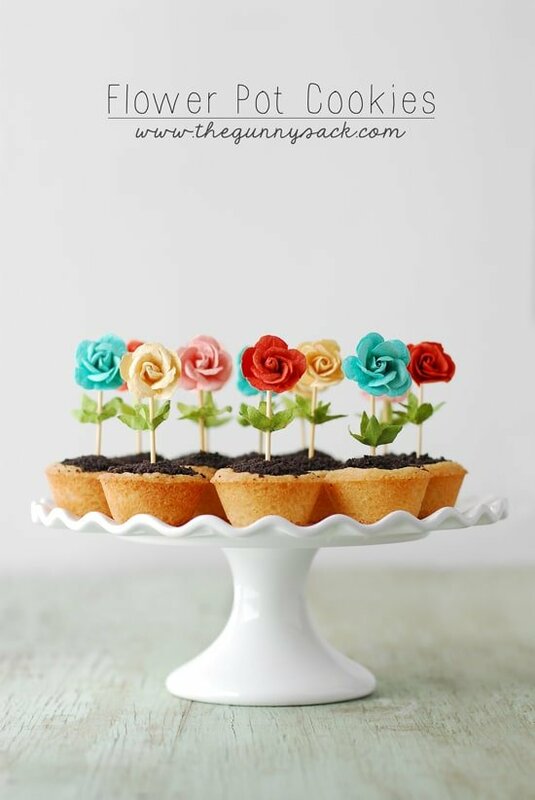 I am looking forward to green grass, budding trees and planting flowers, but for now we can celebrate with adorable Flower Pot Cookies! 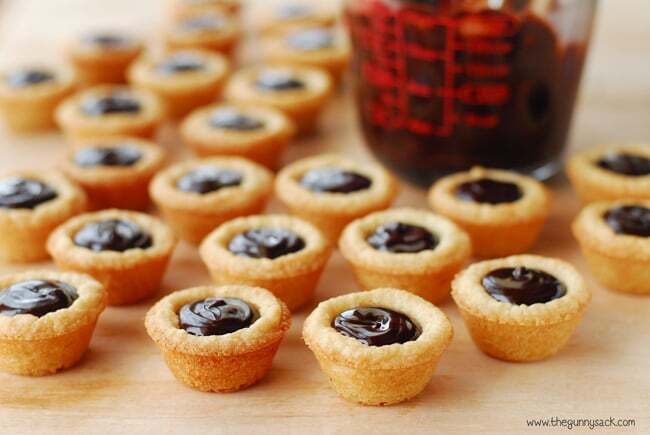 To make the cookies you can use a metal mini muffin pan or a silicone mini muffin pan. The cookies are easier to remove from the silicone pan, so if that is an issue for you try the silicone pan. First, grease the mini muffin pan, separate Pillsbury Ready To Bake Sugar Cookie Dough into the 24 pieces and put one into each cup. Bake at 375 degrees for 11-13 minutes, or until golden brown (put the silicone pan on a cookie sheet). Allow the cookies to cool completely before removing them from the pan. 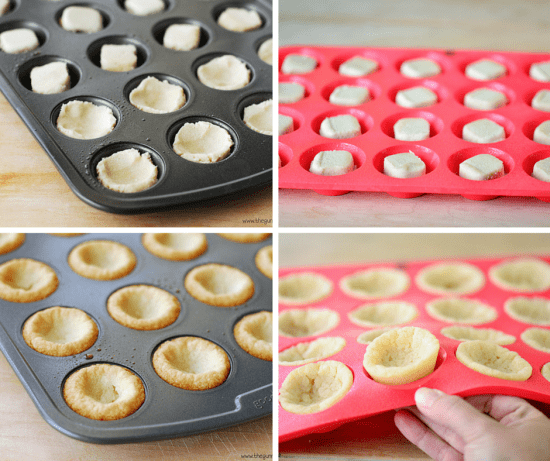 Carefully remove the cookie cups from the muffin tin. I used the tip of a thin knife to gently pop them out. Make chocolate ganache using semi-sweet chocolate chips and heavy cream. Fill the cups with chocolate ganache. Sprinkle with crushed Oreos. Place in the fridge so that the ganache can cool and set. To make the flower cupcake toppers, I used some paper flower embellishments that I found in the bargain bins at Michaels. 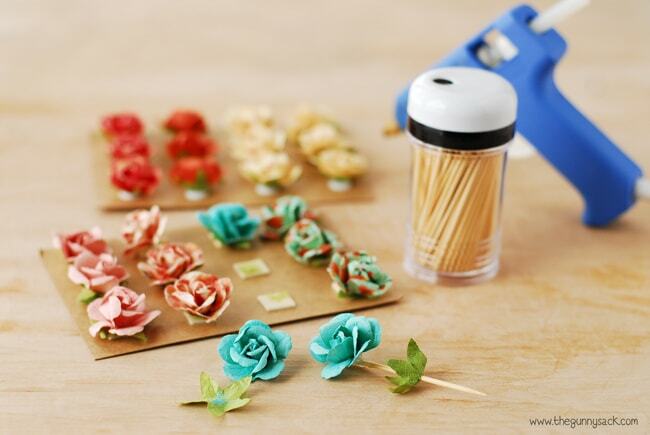 I carefully separated the green leaves from the flowers and glued both onto toothpicks using hot glue. Insert the toothpicks into the chocolate of the cookie cup. They are so cheerful looking and are the perfect thing for spring! 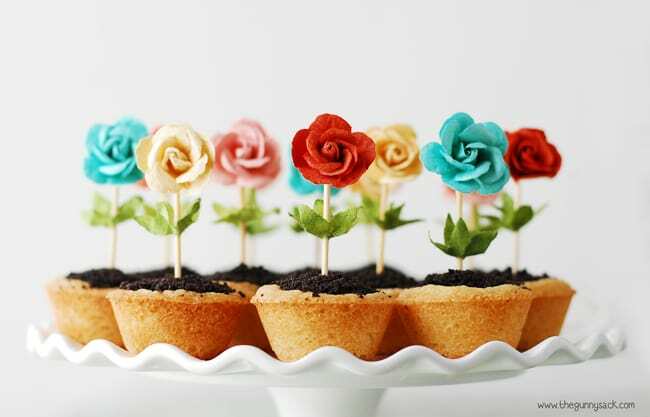 These Flower Pot Cookies, with their bright colors, look great on a white cake stand for serving. Recipe updated from the original posted March 2014. Bake at 375 degrees for 11 to 13 minutes, until golden brown (put the silicone pan on a cookie sheet). Leave the cookies in the muffin pan and allow them to cool completely. Bring 1/2 cups heavy cream just to a boil. I have a question. I have a ton of chocolate mint, and I’d like to start using it. Since you have to heat the heavy cream, how much mint should I put in there so it can steep? Like mint chocolate chips or chocolate mint candy bars? You should be able to substitute an equal amount of mint chocolate chips for the semi-sweet chocolate chips. I’m going to make these for a bake off at my school. My question is do you have to press in the cookie after it cooks or scoop any of it out before adding the ganache? No, I did not have to press or scoop anything before adding the ganache. The center of the cookie cups naturally fell. You can see the indentations in the tops of the cookie cups in the pan in the photos. Good luck with the bake off! 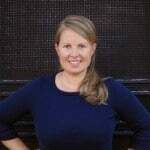 So lovely looking, Tonia. I tried these at home and everything was right except the shapes of the pots. I used a silicone flexible pan (got it from Amazon) like you mentioned but there were huge cracks in the sides. I tried less dilution of the batter but it still gave breaks. Any idea what I might be doing wrong? Thanks. Otherwise, it’s a great recipe and one that has made y daugther’s days. These are so cute. I’m making for my daughter’s birthday this weekend. Do you think I can make the cookie pot ( without the filling) a day or two ahead. If yes, how can I store them? Yes you can. Just store them as you would any other cookies. Best of luck and Happy Birthday to your daughter! of the pretzel stick. Next bake, I will use musk sticks. Thank you for a wonderfully enchanting, and delightful recipe. I like your other recipes too. They are all awesome. Fantastic! I would love to see how they turned out! 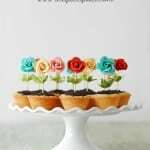 I made 72 of these flower cup cookies for a Spring Banquet as individual favors. I found molded roses at Hobby Lobby 6 for $1.79. I made green stems on the computer and printed them on green card stock. If you have the rubber candy molds, the rose made out of cream cheese and powder sugar would also be adorable and edible. Too bad I didn’t think of that one earlier! I also used the mini muffin papers in the muffin pans and removing them was easy. I choose a polka-dot pattern and they looked really cute. Thank You for a really great idea! Lovely! How far in advance do you think I could make this for a birthday party? Would I just keep it in the fridge? I think they would be okay for a day or two when stored in the fridge. Thanks! What a great idea my grandkids are gonna love this. Saw a recipe like this last year but you put white icing in the middle then cover with green colored coconut and added small Easter candy to them. Also had red vine licorice cut to make handles. Hi Mary Lou! I was thinking about making an Easter Basket version, but then I saw that it had already been done by lots of other bloggers. Maybe I will have to try to come up with my own spin for next Easter. Thanks for stopping by! These are perfect for little girl tea parties. I am.expecting family in a few.Derek’s.3 granddaughters and this.is perfect! Thanks so much!!! Love it! That will be so much fun! I remember having tea parties when I was little. Such good memories! Awesome idea! I have those flowers too. Never thought of using them this way! Really? How perfect! Thanks, Natalia! Hey thank you so much for your reply I really appreciate that .. I will surely try it out and let you know how it turns out .. Thank you for your wishes ..
Hey we don’t eat eggs and the sugar cookie dough has egg in it any idea what’s the alternative .. I want to bake these for my daughters first birthday .. Any feed back will be appreciated ..
I’ve never made eggless sugar cookies but here is a recipe you could try: http://www.novicehousewife.com/2014/02/02/eggless-sugar-cookies/ Happy birthday to your daughter! I hope your party went well! Sorry I didn’t get to you before then! Wonderful! Thanks for stopping back to let me know that they turned out. These are so cute. I make roses out of bubblegum and suckers. Might be something to look into if you wanted an edible flower option. how adorable! so cute for a shower! Can’t find the cookie dough anywhere!!! Any ideas?? Can I use the dough for tarts?? You could use homemade cookie dough! Happy Easter! If replace these flower with some carved fruit, so everything is edible.